Smiley Brothers Logging, LLC is relatively new to the logging scene, but the owners are not new to the logging business. Dale and Dean Smiley logged for years before branching out and starting their own logging company. Dale and Dean Smiley went into business for themselves in 2004, just before the economy fell apart. They stuck it out and worked through the worst of it. Dale logged with his father, Bob, before going into a partnership with his brother. “Our dad logged for years,” Dale says. When their father got out of the business, Dale and Dean went to work for Ken Dysert inthe Scott Valley of northern California. The brothers had worked for Dysert for a few years, when in 2004, an opportunity presented itself. They were able to buy the business from Dysert, including his equipment. The equipment list included a John Deere 690 log loader, a 518 Caterpillar (CAT) grapple skidder, a D6D line CAT, and a D5H grapple CAT. Dale and Dean didn’t give up; they stuck it out, and while some operations shut down, they worked through the worst of it. 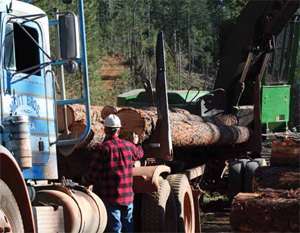 Today they do primarily conventional logging for Roseburg Forest Products and deliver logs to the mill in Weed, Calif.
“We do some work for Campbell as well,” Dale says. Dale and Dean run an economical operation. They have a small staff and do the majority of the equipment repair themselves. Things are improving for the brothers. Dale says 2011 was definitely better than the previous three years, and prospects for the 2012 season are looking up. Dale believes the upswing probably has a little bit to do with a flicker of improvement in the housing market, but the demand from the export market has definitely helped out. Dean agrees the logging has picked up slightly, but he doesn’t attribute it to new construction, but rather to the export market. “I think a lot is going elsewhere,” he says. So far, the Smileys have been able to stay busy logging. “But as far as making a living — it’s definitely been hard,” Dale says. They have also kept busy by cutting telephone poles. “That has kept us working when the market was tight,” says Dale. 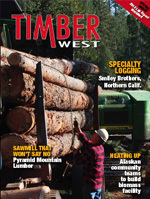 In 2009, when the logging market slowed to almost a standstill, they primarily logged telephone poles, which were delivered to Sierra Pacific Industry in Anderson, Calif.
Because Smiley Brothers Logging is a small outfit, Dale and Dean have an advantage over larger operations in that they can switch to a specialized project like telephone poles quickly. “We always fall back on telephone poles. Telephone poles really haven’t changed much. They’re always wanting telephone poles,” Dean says. The Smiley brothers carry a small staff. “We have our cutters, our contractors, and we have two people on payroll,” Dale says. They’ve been able to keep their staff on without having to lay them off other than the 2009 season when they were only able to keep one employee. 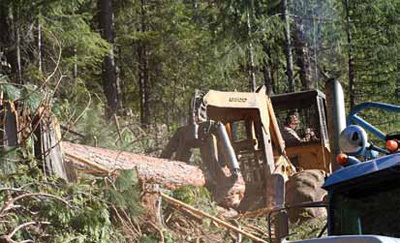 “This year is the first year we’ve had two people on fulltime,” Dale says, which he thinks is an indicator things are getting better in the logging industry. 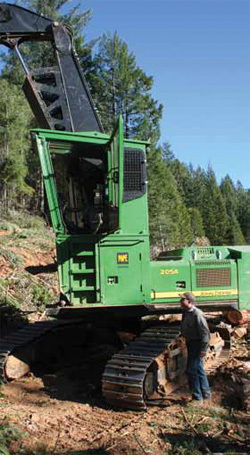 The brothers do primarily conventional logging for Roseburg Forest Products and deliver logs to the mill in Weed, Calif. The weather also cooperated this year. The Smiley brothers logged into January 2012 thanks to a record-breaking dry winter. Rain and snow didn’t arrive until mid-January. While they continued logging until the weather shut them down, there are concerns it could still be a dry year. Winter storms are a mixed blessing in Northern California. Without them you can log more, but the lack of storms also increases the risk of fires come summer, which can shut down a season prematurely. If they’re working in the Redding area, for instance, they may only be able to log certain days, and they could be shut down earlier because of fire hazard, Dean said. “It seems like the last few years, the springs have been a lot longer than normal,” Dean said. The brothers have changed up the equipment since 2009, but it’s still pretty much Deere and Caterpillar. They currently have a John Deere 2054 log loader, a CAT 518 log skidder, a Cat D5 grapple, and a D6 line Cat. They also use a 690 John Deere loader for cleanup if they’ve got two sites going. Looking a bit out of place is the Danzco pull-through delimber, which also helps keep them productive and flexible. And, of course, there are a couple Steel chainsaws — models 66 and 46. “We don’t have the feller bunchers or anything like that,” Dale says. All of their falling is done with a chain saw. The brothers are also pretty handy when it comes to machinery and handle most equipment upkeep and repairs, which keeps costs down. However, when it comes to the big repairs, Dean says they hire those out locally. At the time this article was written, the season was almost shut down for the winter, and they were working in the Burney area, where they were logging more telephone poles. Dean was already looking forward to a good 2012 season. “It seems to be starting to look up. It’s definitely a lot better than it has been in the last few years,” he says. Dale agrees and expects to see 2012 playing out much like 2011. “We’re supposed to have work,” he says, and that’s always a good sign.